Mandala (Sanskrit maṇḍala «circle») is of Hindu origin, but is also used in a Buddhist context, to refer to various tangible objects. In practice, mandala has become a generic term for any plan, chart, or geometric pattern which represents the cosmos metaphysically or symbolically, a microcosm of the universe from the human perspective. A mandala, especially its center, can be used during meditation as an object for focusing attention. The symmetrical geometric shapes which mandalas tend to have, draw the attention of the eyes towards their center. Psychiatrist Carl Jung saw the mandala as a representation of the unconscious self. His paintings of mandalas enabled him to identify disorders, and achieve wholeness in personality (Jung: Memories, Dreams, Reflections, pp. 186-197). In Hindu cosmology the surface of the earth is represented as a square, the most fundamental of all Hindu forms. The earth is represented as four cornered with reference to the horizon’s relationship with sunrise and sunset, the north and south direction. The earth is thus called Caturbhrsti (four-cornered) and is represented in the symbolic form of the Prithvi Mandala. The astrological charts or horoscopes (Rasi, Navamsa, etc) also represent in a square plan the ecliptic—the positions of the sun, moon, planets, and zodiacal constellations with reference to the native’s place and time of birth. The Vaastu Purusha Mandala is the metaphysical plan of a building, temple, or site that incorporates the course of the heavenly bodies and supernatural forces. A mandala in tantric Buddhism usually depicts a landscape of the Buddha land or the enlightened vision of a Buddha. 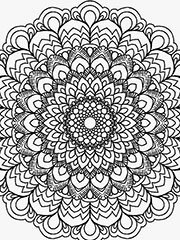 Mandalas are commonly used by tantric Buddhists as an aid to meditation. The photograph at right is a good example of a Tibetan sand mandala. This pattern is painstakingly created on the temple floor by several monks who use small tubes to create a tiny flow of grains. The various aspects of the traditionally fixed design represent symbolically the objects of worship and contemplation of the Tibetan Buddhist cosmology. The visualization and concretization of the mandala concept is one of the most significant contributions of Buddhism to religious psychology. Mandalas are seen as sacred places which, by their very presence in the world, remind a viewer of the immanence of sanctity in the universe and its potential in himself. In the context of the Buddhist path the purpose of a mandala is to put an end to human suffering, to attain enlightenment and to attain a correct view of Reality. It is a means to discover divinity by the realization that it resides within one’s own self. See also: Wheel of Life. The mandala is usually a symbolic representation which depicts the qualities of the enlightened mind in harmonious relationship with one another. A mandala may also be used to represent the path of spiritual development. On another level a mandala can be a symbolic representation of the universe, as in one of the four foundation practices of the Vajrayana, in which a mandala representing the universe is offered to the Buddha. One important type is the mandala of the «Five Buddhas,» archetypal Buddha forms embodying various aspects of enlightenment, the Buddhas depicted depending on the school of Buddhism and even the specific purpose of the mandala. A common mandala of this type is that of the Five Wisdom Buddhas (aka Five Jinas), the Buddhas Vairocana, Aksobhya, Ratnasambhava, Amitabha, and Amoghasiddhi. When paired with another mandala depicting the Five Wisdom Kings, this forms the Mandala of the Two Realms. The mandala in Nichiren Buddhism is called a moji-mandala (文字漫荼羅) and is a hanging paper scroll or wooden tablet whose inscription consists of Chinese characters and medieval-Sanskrit script representing elements of the Buddha’s enlightenment, protective Buddhist deities, and certain Buddhist concepts. Called the Gohonzon, it was originally inscribed by Nichiren, the founder of this branch of Japanese Buddhism, during the late 13th century. The Gohonzon is the primary object of veneration in some Nichiren schools and the only one in others, which consider it to be the supreme object of worship as the embodiment of the supreme Dharma and Nichiren’s inner enlightenment. The seven characters Nam Myoho Renge Kyo, considered to be the name of the supreme Dharma and the invocation that believers chant, are written down the center of all Nichiren-sect Gohonzons, whose appearance may otherwise vary depending on the particular school and other factors. In the West, mandala is also used to refer to the «personal world» in which one lives, the various elements of the mandala being the activities and interests in which one engages, the most important being at the centre of the mandala, and the least important at the periphery. Depicting one’s personal mandala in pictorial form can give one a good indication of the state of one’s spiritual life. One of the lesser-known emblems of Discordianism is a mandala found in the Principia Discordia. It is pentagonal in shape and consists of five identically-shaped linked elements, each of which forms one point on the outside of the mandala. As is noted in the caption, «No two of the five elements interlock, but all five do interlock.» Inside of the pentagon formed by these elements is the Five-Fingered Hand of Eris.